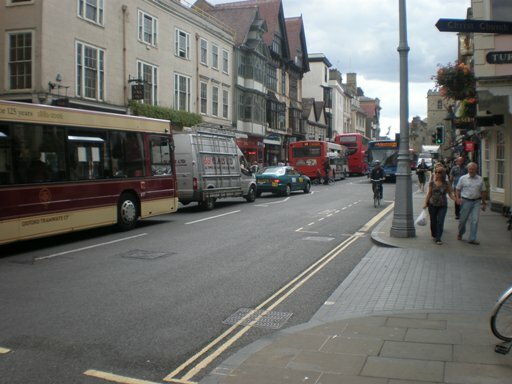 Oxford has promoted buses for nearly four decades, using bus lanes, bus gates and Park & Ride. Buses are able to avoid the worst traffic congestion, so almost all services can be run commercially. Access to Oxford is 29% car, 43% bus, 10% bike, 17% walk (cordon counts – which include some cross-centre journeys). Compare with the famously bike-friendly Groningen in the Netherlands – 21% car, 27% bus/train, 31% bike, 20% walk (on-street survey). Having lots of buses works quite well – buses are excellent at cutting traffic on the main roads, particularly from out of town. The relatively low bike share means that the shopping area doesn’t get overrun by bike-parking. Buses are a bit intimidating to cyclists, but at least they have professional drivers who can be traced (and they know it).